A great holiday ham glaze needs to have three things; a wonderful flavour, a gorgeous, shiny appearance, and a crispy, crackling crust you can hear across the room. I’m happy to report this easy to make glaze has all those things in abundance. This honey glaze will work on any size or style of ham, and as long as you keep the mixture quite thick, and caramelise it properly at the end, you will be the proud owner of a magazine cover-quality ham. As I mention in the video, this was an uncured, fully-cooked, country-style ham, and if you use something similar, I’m recommending you pull it at 130 F. internal temp. Remember, ham is already cooked, so we just want it hot enough to eat. By the way, if you’re using a ham that’s not cooked already, you’re on your own! The type of ham I used doesn’t contain a lot of added water like most hams in the supermarket, so it’s even more crucial to use a thermometer to achieve the proper temp. The meat has a denser, drier texture, and while the payoff is a superior ham flavour, it can get dry and salty if overcooked. If you’re using a standard ham, you can use the exact same procedure, but maybe go to 140 F., since you have a lot wetter product to work with. I realise many guides say to go to 160-180 F., but I have no idea why. No matter what ham you use, you’ll need to give the glaze a final caramelising before it gets anywhere near kale and tiny apples. They say you can crank the oven up to 500 F., or use the broiler, but nothing does a better job than the old blowtorch. If you don’t have one, they’re only $15 at a hardware store, and are an invaluable tool in the kitchen. 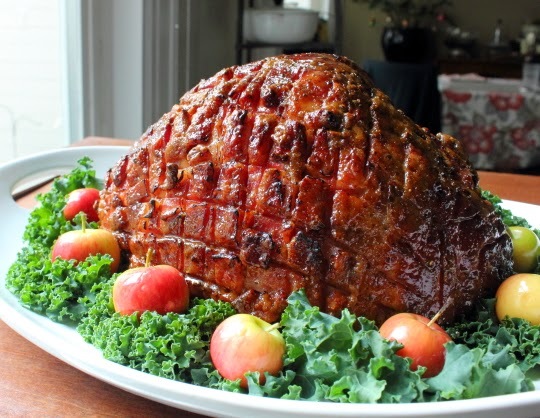 So, if a holiday ham is on your menu, I really hope you toss out that packet of who-knows-what, and give this wonderful, crispy honey ham glaze a try. Enjoy!